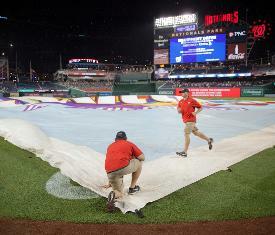 The New York Yankees and Washington Nationals have announced that both the resumption of Tuesday's suspended game, as well as Wednesday's scheduled game, have been postponed due to inclement weather in Washington, D.C. Both games have been rescheduled for Monday, June 18, beginning at 5:05 p.m.
Tuesday's game entered a rain delay between the top and bottom of the sixth inning, with the score tied 3-3, and was eventually suspended after a delay of just over an hour. It was set to resume at 5:05 p.m. Wednesday, with the regularly scheduled game to follow after the conclusion of the suspended game, but that same format will now happen instead on June 18. That June 18 date will mark a mini-road trip for the Yankees, who originally had a day off in the midst of a nine-game homestand. They will now finish their four-game set with the Rays on June 17, head to DC for the rescheduled games on June 18 and then return home to play a three-game series against Seattle starting on June 19. The first two games of that homestand, June 12 and 13, are also against the Nationals, so the reschedule means that the two teams will play almost the entirety of their four total games against each other within a week's time.